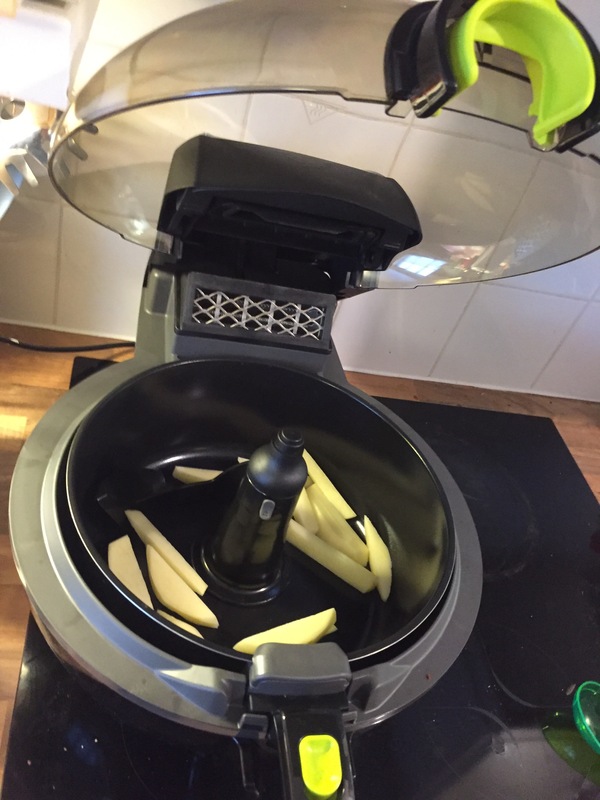 So it was my partner’s 21st birthday the other day and he wanted a tefal actifry. Don’t ask why – we’re like an old couple really, we like kitchen appliances. So today I used it. 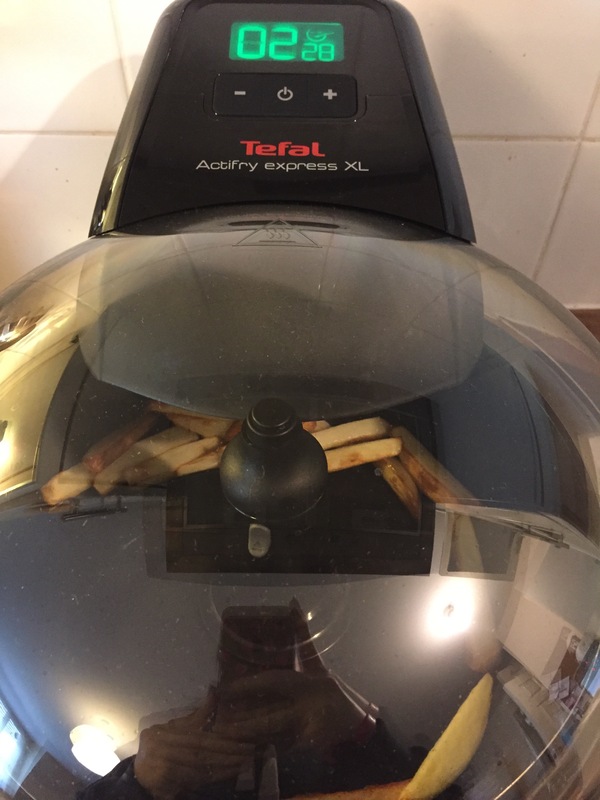 I got him the tefal actifry express XL because he is hell bent on having something that’s ‘future proof’ and it was on offer for Black Friday. (It’s normally £250 but I got it for £160). I highly recommend it, but a cheaper model perhaps. 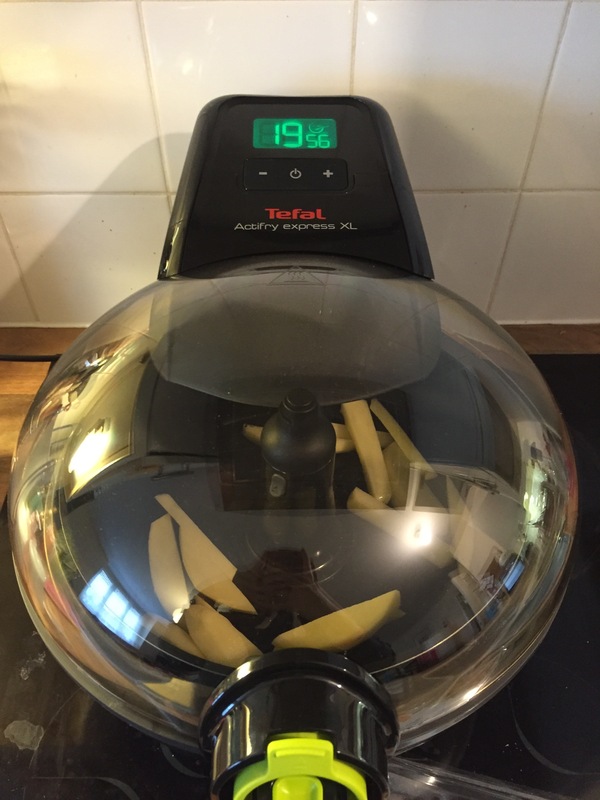 The actifry mini makes two portions and is frequently on offer at £99.99. 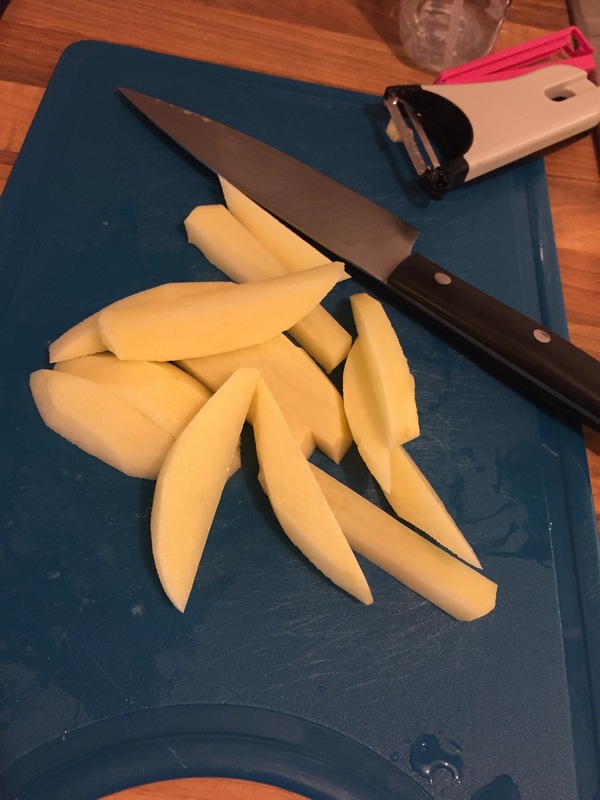 So it’s chip time, and I cut up 150g peeled Maris piper potatoes into chip sized chunks. Oh they do look good. 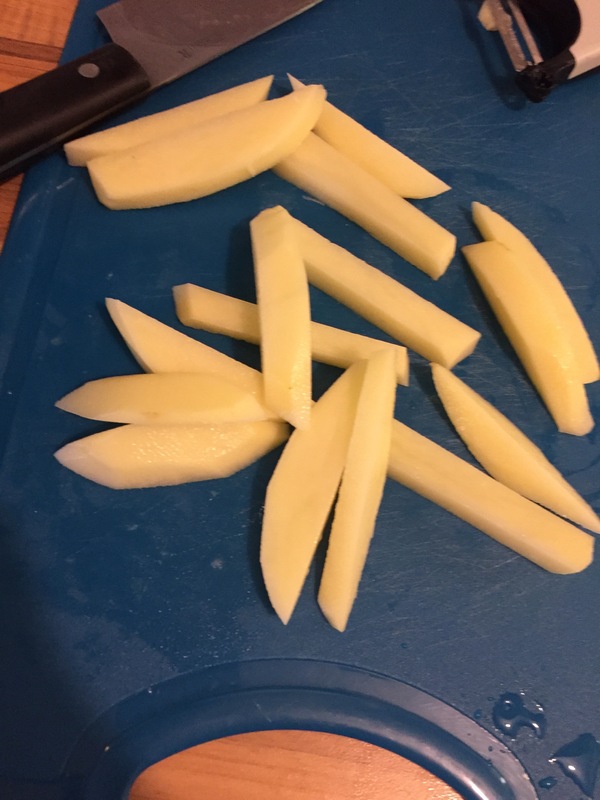 So I put them into the actifry like so… And I only put one portion worth in there but the capacity is 1.5kg if anyone’s interested on this particular model! 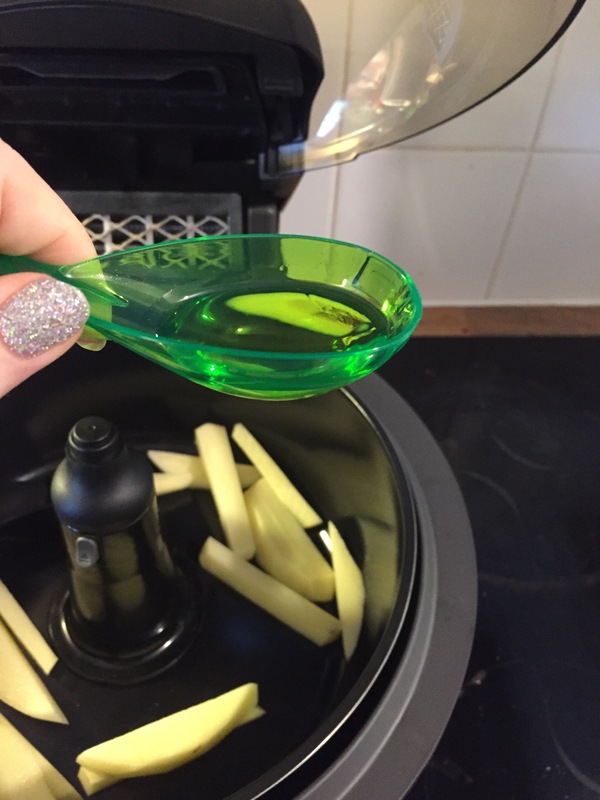 So it’s famous that 1kg of crispy chips only needs 1 spoon of oil – as I was only making one portion I used a minimal amount of oil. 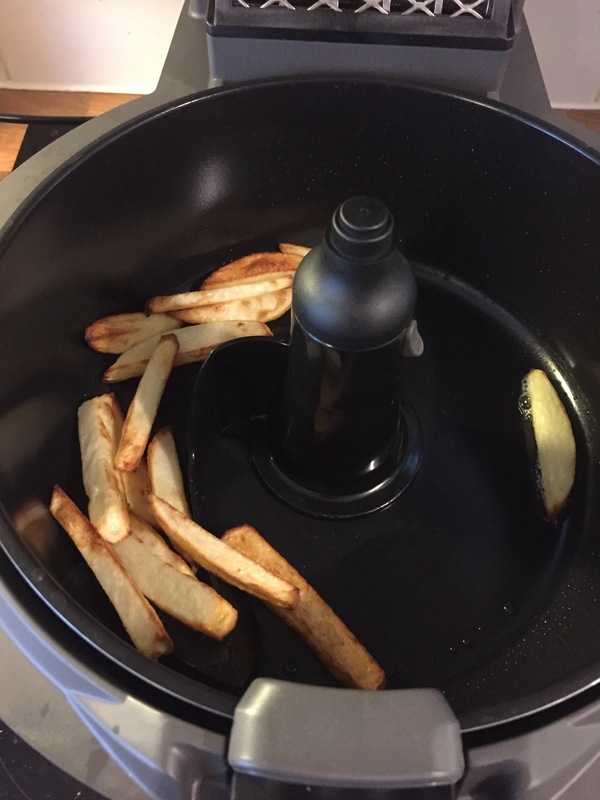 For a single portion of chips in the express actifry I set it for 20 minutes to create crispy, beautiful chips. So they started looking quite nice and crispy. And can I just say how impressed I was with this machine! It’s amazing. These chips are genuinely crispy and seriously 100 times better than any chips I’ve ever had from a deep fat fryer before. Hey fish and chips – looking good. I am a huge fan of proper spaghetti bolognese. The kind where you simmer it for hours with all its bacony–beefy goodness. I used to use 8 rashers of bacon, a 500g pack of mince, veg and homemade sauce – but eat it all to myself with 4 portions worth of spaghetti. Now I’ve worked out a healthier way of making my amazing slow cooked bolognese and I cannot wait to eat some more soon. The trick is to portionise it and freeze batches. 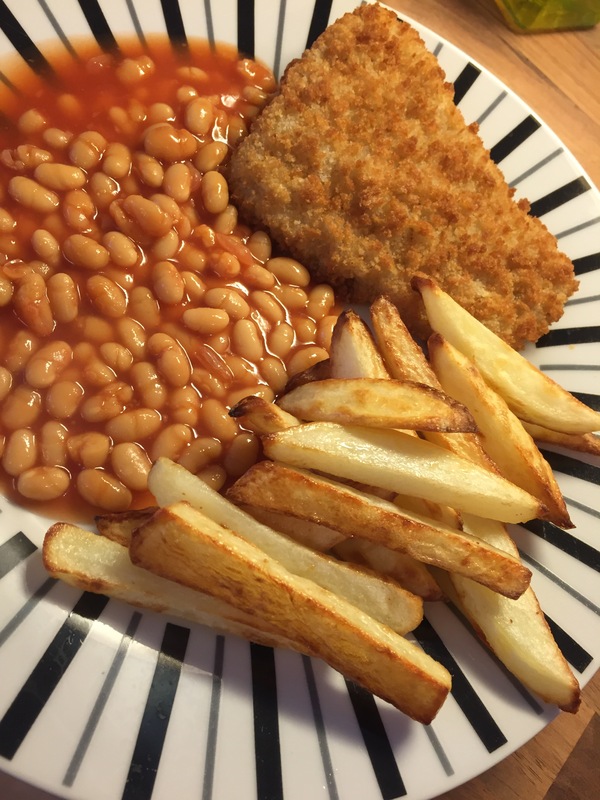 When you want a portion, just put it in a saucepan on a low heat. Oh my goodness, it’s heavenly. I get a bit cautious when it comes to pasta and bolognese – how much pasta should I have? Most packets recommend 100g dried pasta, cooked. But then that amounts to 350 calories and suddenly I’m not so happy. 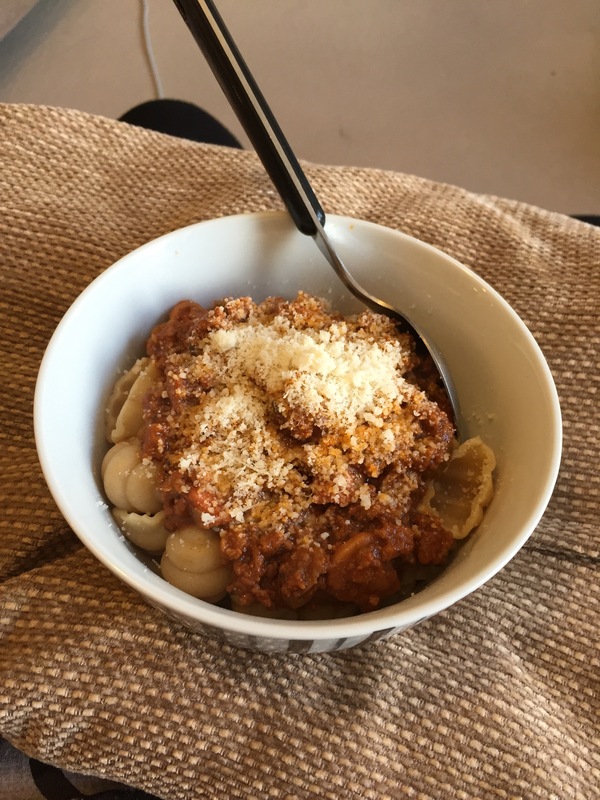 My secret is to use 50g dried pasta, cooked – it may seem like a small amount but once you add the bolognese and a cheeky bit of Parmesan and you have a good 500 calorie meal. I always use wholewheat pasta, and now I no longer like white pasta. As for my bolognese – has anyone ever heard of muscle food? I rarely buy my meat from anywhere else. It offers the leanest meat I’ve been able to find and I pride myself on low fat meat. It’s all delivered in a cooked box and, as long and you put the meat in the fridge once delivered, it’s a really amazing service. It’s also where I buy my venison from my earlier post! Their extra lean beef mince (4% fat) is the leanest I’ve been able to find anywhere, with most supermarkets only offering 5% fat. They often do bulk offers where you can buy a hamper of different meats for bargain prices. It’s all good quality and lean. There is no such thing as a proper bolognese without bacon. Muscle food offer the leanest bacon I’ve found with all the fatty parts trimmed from the leanest cuts of pork. I use a rash of bacon per person so cooking bolognese for four will involve 400g beef mince and four bacon rashes. I’m sure you all have your own recipes for bolognese and I’m sure you’ll all pass them down generations in your family, but mine is the best. But really it depends if you want to try a new bolognese recipe. I’ll gladly post mine – one day. But, for now, it’s my family secret!